Why exercise? The latest updates. Check here for new exercise videos, illustrations, helpful tips and the latest science in the field. Check here also for the author's personal exploration of the world of health and fitness and updates through Twitter, Instagram, Pinterest and Facebook. To contact me with requests or other feedback, please visit the contact us page. I would enjoy hearing from you! 10 life changing lessons in a week of intense stress! You know those weeks when life hits hard and won’t let up, when people may have let you down, things you were counting on fall through and your work and personal responsibilities collide? How do you hang on to your sanity and sense of well being when over and over, you’re faced with tough, on-the-fly decisions under pressure? #1: Be concerned with unfairness, not disrespect. #2: Know your limits. Stop working when it’s time to rest. #3: Annoying mistakes happen under pressure. Own them & keep moving forward. #4: Reconsider what you think is truly stressful. #5: Deal with your stress and your symptoms may just go away! #6: Discipline brings peace. Get your work done so you can truly relax. #7: Make room for cardio exercise. It’s great stress relief & healthy for your brain. #8: Recognize when you must confront and even express anger. #9: Trust your decisions. Reflect to improve for next time, not to worry & second guess yourself. #10: Stress reveals tendencies that can improve with practice and some help. Stress seems to have such a big impact on the personal choices that affect our health. I hope this video will help you think about the ways you can grow stronger through life’s surprises and challenges. I was far from my usual exercise routine as I visited my family over the holidays. But I had no problem keeping myself moving with my niece and 4 nephews, ages 3-15. We played basketball and football, ping pong, wrestled inside and outside of the house, ran / walked with the dog, and went hiking. 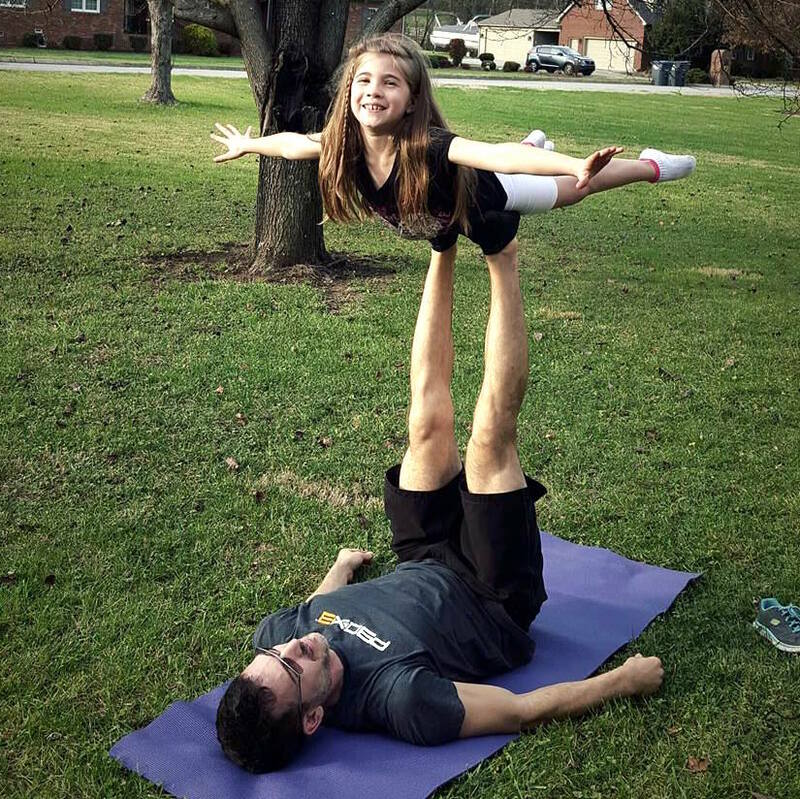 We were doing handstands, cartwheels and even some acroyoga. And when rain made the yard wet and a little muddy, that didn’t stop us. We took our shoes off for tag. By the end of the week we reached the point where they’d wake me up in the morning just to chase them around the house (which seemed to be the 3 year old’s favorite). Video games and movies were in the mix too, but not without enough movement for everyone, myself included. I didn't track it, but I'm sure we were getting well over 45 minutes of exercise per day, and everyone had a great time. If you have kids around, exercise is fun. You can get it done! For your reference, these articles compare calories burned and give you more exercise ideas for your family. Reviews like these make the time and effort of creating a book worth it for me. I'm very happy to see the wide range of applications for Progressive Core Strengthening. Go to the article and scroll to the bottom to see more reviews from Facebook. Continue reading "Reviews of Progressive Core Strengthening"
The back stretching exercises article has been updated with more detailed illustrations and stretching instructions! 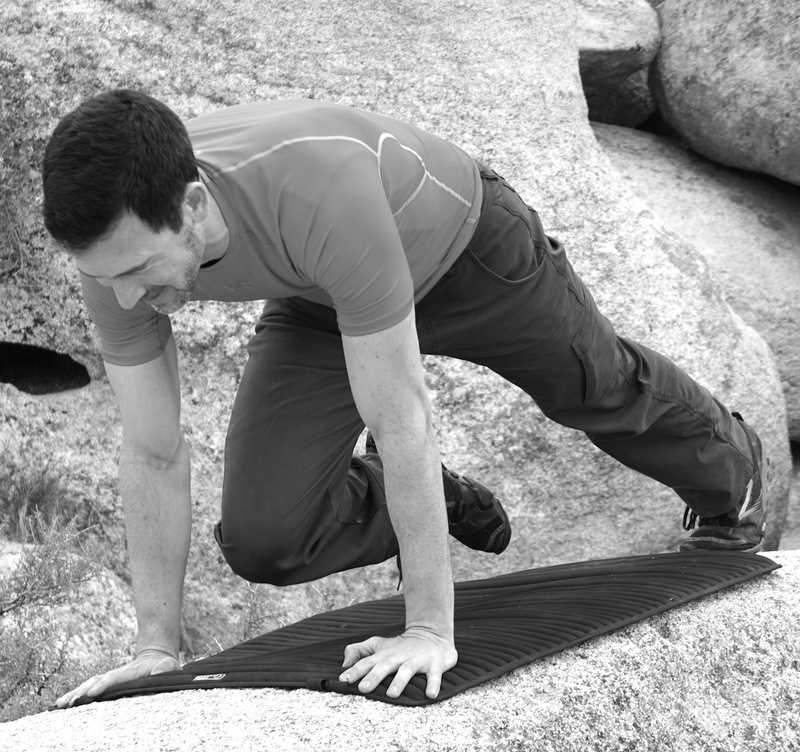 You also have the option to order and download exercise cards to help you practice your stretches more consistently. Continue reading "Back stretching exercises update"
The wheels are beginning to turn for social media on whyiexercise.com. The social media hub will be the Facebook fan page. The feed on Facebook will have many of the latest videos, pictures and info. From here you'll see direct links to Instagram, Twitter, Pinterest and the YouTube channel so you can check out anything you might have missed. Continue reading "Facebook, Instagram and social media"
Have you seen the new e-book? 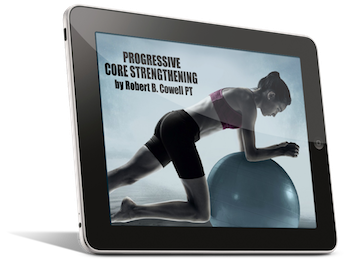 If you are looking for expert instruction to take your core strength to the next level, look no further than Progressive Core Strengthening. This book will teach you to perfect your form and protect your back as you work your way through 6 levels of exercise, intro to advanced! Also check the store for other titles, including an updated version of Correct Posture and introductory guides to stretching and core strengthening. 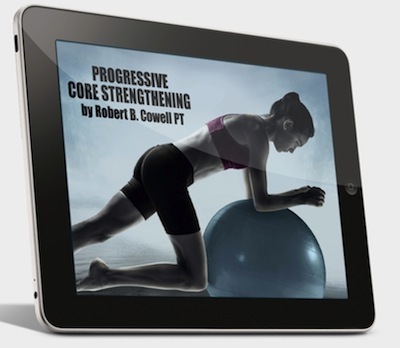 Continue reading "Progressive Core Strengthening"
Every so often I check the links to whyiexercise.com so I can learn more about my readers. I wanted to share what I discovered last week from referring sites. See Dr. Strover's article through the link at the end of this post. whyiexercise.com is listed at #9. Progressive Chiropractic, a Victoria, BC clinic with cutting edge diagnostics, also uses whyiexercise.com as a reference. Dr. Mark Smith's office has linked to back strengthening exercises as a resource for their patients. Kimberly Garrison, Daily News personal fitness columnist at philly.com, referred to whyiexercise.com in her 9/25 article on calorie counting. "…the website whyiexercise.com has calorie expenditures for lots of activities at a range of weights" See the articles on metabolic equivalent and calories burned during exercise. 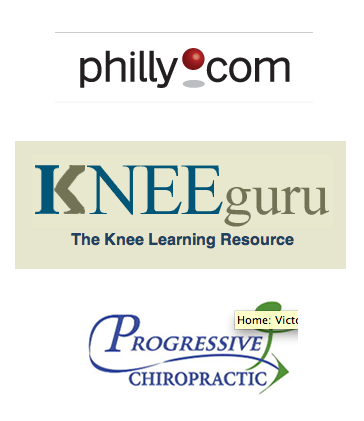 It's great to see that whyiexercise.com has been a helpful resource for knee care, back care and calorie counting! Continue reading "Recent links and mentions"
Also in this video is my workout buddy, Ken, doing his first muscle up. We've been training together for months, and I felt like he had the strength to do a muscle up, so 3 weeks ago I had him start trying. He didn't pull it off in the first couple weeks because he was having trouble with the timing of the movement. Then, spontaneously, he decided to run to the bar to try the move. It worked out perfectly as you'll see in the video. Did you hear us cheering each other on? I was pretty excited after Ken's muscle up! This type of workout is so much fun for our group, and that keeps us coming back every week to get in better shape. 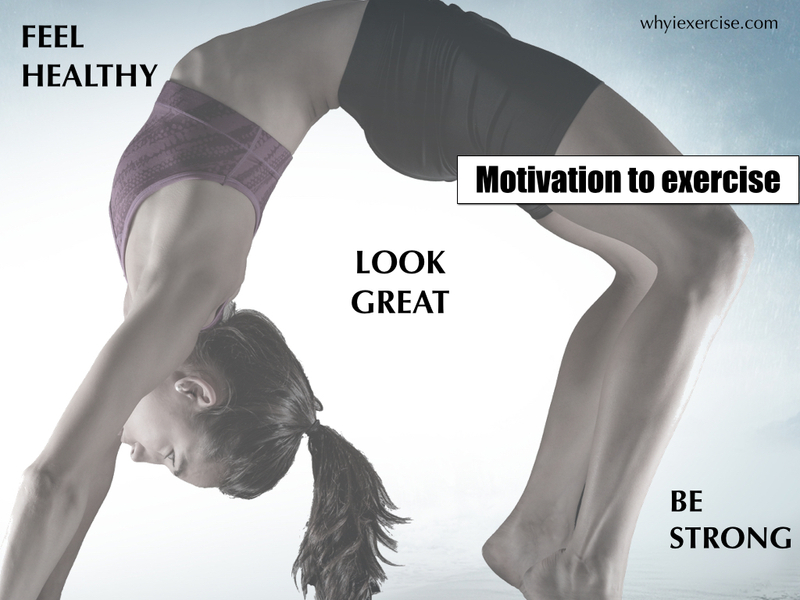 See the link below to read more about exercise motivation. Continue reading "Learning new exercises at Muscle Beach"
Last week I discovered that illustrations from whyiexercise.com have been pinned on Pinterest quite a bit more over the past several months. Great to see that readers are enjoying the pictures! I also started a Pinterest board for whyiexercise.com. There are 7 pin boards with 56 illustrations, including workout routines, exercise instructions, exercise charts and fitness charts. Follow me on Pinterest to see the updates. Continue reading "Whyiexercise.com Pinterest update"
The best shape of my life! Continue reading "The best shape of my life!" 1.5 mile run charts in a Reddit.com debate! 1.5 mile run charts from whyiexercise.com were the subject of quite a humorous exchange on reddit.com. Continue reading "1.5 mile run charts in a Reddit.com debate!" Continue reading "Testimonials for whyiexercise.com"
A medical group in Atlanta recommends whyiexercise.com as a health and fitness resource. As stated on their site: "This free website features links to free online exercise videos, exercise illustrations, home exercise programs and physical fitness tests to help you gauge your current strength and endurance levels against others your age." Continue reading "Atlanta weight loss clinic recommends whyiexercise.com"
New e-book, Correct Posture, featured on whyiexercise.com! Created by the author of whyiexercise.com, Correct Posture for Your Back shows you how to relieve muscular fatigue, stress and tension in your back, build core strength safely, improve your first impressions, and most importantly, how to prevent serious back problems. This user friendly book includes over 120 detailed illustrations. Continue reading "New e-book, Correct Posture, featured on whyiexercise.com!" 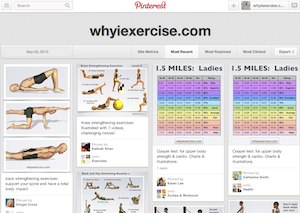 Exercise routines and charts from whyiexercise.com are becoming popular on Pinterest! Some of the favorites are the routine of knee strengthening exercises, the push up chart for ladies, and the routine of body weight exercises. 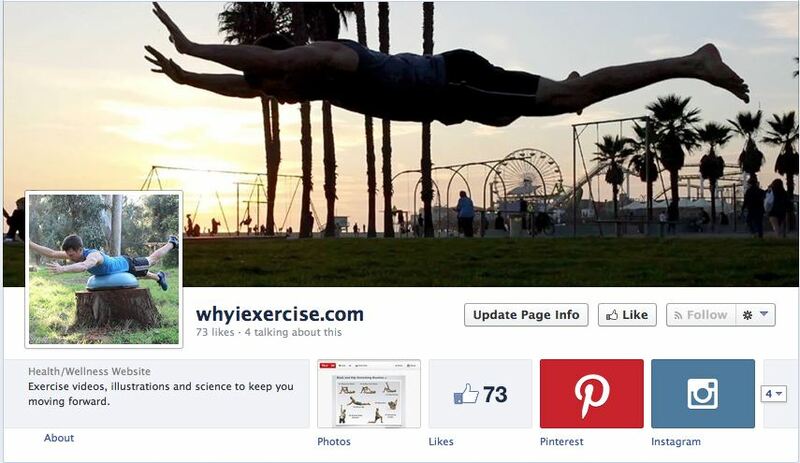 Continue reading "Whyiexercise.com is on Pinterest!" Scroll to the bottom of this article to see the latest body weight / gymnastics exercises I've been working on, including a transition from a seated L position to a handstand, slow muscle ups (a pull up followed by a dip) on gymnastics rings, and rope climbing with a full overhead reach. The ongoing challenge of this routine gives me great motivation to exercise! Continue reading "New exercise video update"
Motivation to exercise: Stories to keep you moving forward! Continue reading "Motivation to exercise"
The CDC studied 7 markers of cardiovascular health in teens including diet, body mass index, smoking, cholesterol, physical activity and blood sugar. Amazingly, not 1 child out of over 4000 studied met the criteria for a healthy diet, and physical activity scores were less than ideal for over 50% of teens. Continue reading "Poor heart health scores found in children"
Obesity and overweight trends projected to worsen in U. S.
I was stunned to learn that 72 percent of men and 63 percent of women are currently overweight or obese. Based on this, it's not surprising to see that Northwestern Univ. projects 83 percent of men and 72 percent of women to be overweight or obese by 2020. They are also saying that by 2020, 77 percent of men and 53 percent of women will have dysglycemia (pre-diabetes). Continue reading "Obesity and overweight trends projected to worsen in U. S."
Home cardio exercises with no equipment required! Continue reading "Home cardio exercises"
Continue reading "Metabolic syndrome x"
Assuming Gallup's numbers for frequent exercisers are on target, it's no wonder we have so many chronic health issues in the US! Continue reading "Only 51% of americans exercise more than 90 minutes per week"
Continue reading "Study on life expectancy shows need for exercise and healthy diet"
Reasons to exercise: Build your health, prevent disease and disability and lower your medical costs. 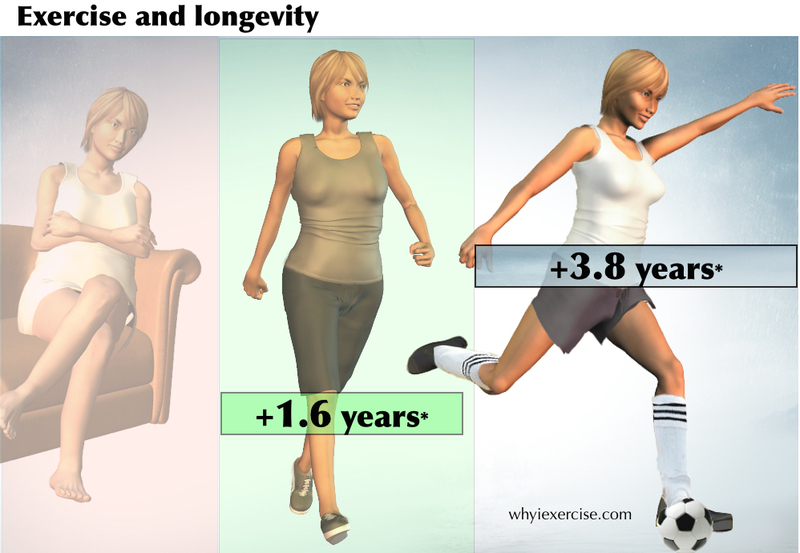 Continue reading "Reasons to exercise: real life examples, illustrations, statistics"